If your 13-inch, non-Touch Bar MacBook Pro has been hit by a nasty issue of an expanding battery, Apple has got your back – the company has launched a battery replacement program for affected laptops, which apparently are only a few in number and were manufactured between October 2016 and October 2017. "Apple has determined that, in a limited number of 13-inch MacBook Pro (non Touch Bar) units, a component may fail causing the built-in battery to expand," says Apple. "This is not a safety issue and Apple will replace eligible batteries, free of charge." Just type in your computer's serial number to see if your MacBook Pro is eligible for a battery replacement. If it is, you can send it off to Apple or take it into an Apple Store to get the battery swapped for free. You can even get a refund if you've already had the battery replaced. The offer was first spotted by 9to5Google. This doesn't affect the standard warranty of the laptop, Apple notes in its documentation, and if your computer has been damaged in some way that prevents the battery being replaced, that will have to be fixed first – and that repair may incur a cost, before you get your free battery swap. 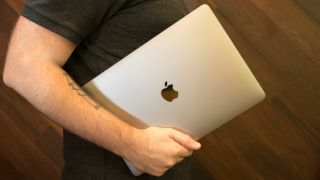 You don't necessarily have to rush to take advantage of the deal, though acting sooner rather than later is probably a good idea: Apple says the scheme is going to cover affected MacBook Pros for up to five years after they were originally bought. The launch of the program comes just a few days after Apple initiated a similar replacement offer for the Apple Watch Series 2. Again, swelling batteries are the problem, but even if it's disappointing to see some devices slip past Apple's quality control procedures, at least it's helping customers get a fixed sorted out quickly.